Ferns aren't content to be like most other plants we commonly use in our landscaping in New England. You know that oddball in a group of people, the one who insists on sticking out and being different? Well, in the plant world, that would be the fern. For one thing, it reproduces via spores, not flowers and seeds (a trait it shares with moss plants). But its oddness doesn't stop there. In reading descriptions of ferns, you'll come across terms with which you may not be familiar if you're a new gardener (and acquainted with only the more run-of-the-mill landscape plants). One such term is "frond." Ever the showoff, ferns insist on having their foliage called "fronds," rather than the usual "leaves" with which most other plants are content. 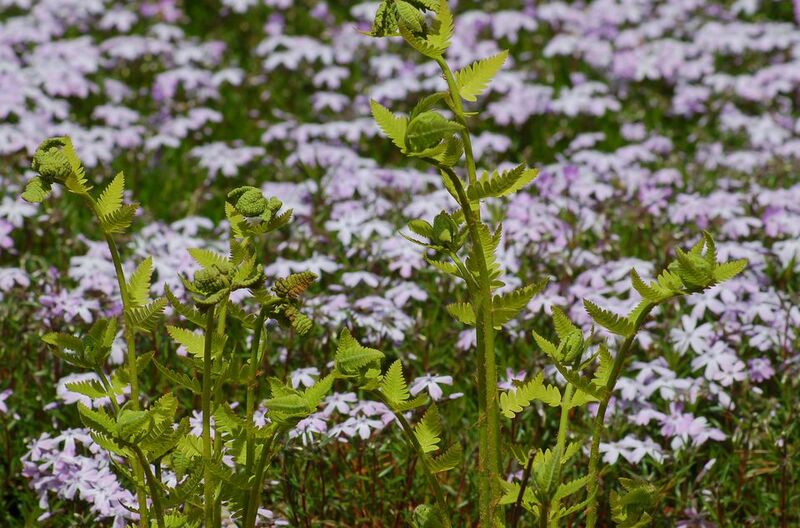 But how did the interrupted fern (Osmunda claytoniana) acquire such a seemingly crazy name? Well, the name derives from how the appearance of the frond evolves over the course of the spring and summer. The frond is a compound leaf composed of smaller leaflets branching to the left and right of the central axis. At the bottom and at the top of the frond are sterile leaflets, but in between there are some fertile ones (i.e., they bear reproductive spores) that disappear by the middle of the summertime, causing an "interruption" (gap). Ferns spread not only by means of spores but also via rhizomes. This enables them to colonize a patch of ground over time, to the point of establishing a monoculture (tip: it also helps them keep soil on a slope from eroding away). The frond stalks remain from year to year and form, along with the rhizomatous mass, the dense clump with which you will be familiar if you've ever dug around the base of a fern. An individual interrupted fern plant typically reaches a height and spread of about 2-3 feet and is vase-shaped; plants can grow taller under ideal conditions. Put their height to use by locating them toward the back of your shade garden, where their light-green fronds will serve as a bright backdrop for your shorter shade-garden perennials. By the way, Osmunda claytoniana is unrelated to sweet fern, which is another native of eastern North America but not a true fern. This eastern North American native plant is best suited to growing zones 3-8. In its wild habitat, it is typically found growing in areas that are shaded and that are moderately wet. Take into account its tolerance for shade and need for moisture when deciding how to utilize the plant in your landscaping. Note, however, that it is shade-tolerant rather than completely dependent on shade (in the Northeastern U.S., at least), even though many list it only for "partial shade or shade." My own interrupted fern is shown in the picture above (with the full-sun plant, creeping phlox, in the background); it is located near a water feature in a spot that receives sunlight most of the day. It performs just fine for me, despite the lack of shade. It does, however, receive ample water. A humusy soil protected by garden mulch will help it retain the moisture it needs. Interrupted fern prefers a soil pH that is acidic. In fact, the latter used to be classified in the same genus, Osmunda, as an interrupted fern (the -astrum suffix indicates "similar to"). According to the Hardy Fern Library, ostrich fern, too, used to be placed in the Osmunda genus. And where in this mix do fiddleheads fit, those edible delights eagerly sought by wild foods enthusiasts? Well, a "fiddlehead" is not so much a specific kind of fern as it is the spiraled tip of a young fern (on an interrupted, ostrich, cinnamon, and various other ferns). Even though these curvaceous tips look similar from one type of fern to the other, they are not created equal in terms of taste. I'm not an expert in this area and so will withhold advice, but aficionados say that ostrich-fern fiddleheads taste best. Would that it were as simple as deciding which one is tastiest! For, unhappily, there are health problems associated with eating fiddleheads unless you know what you're doing, as the University of Maine warns. Some types are not safe to eat at all, and even ostrich-fern fiddleheads must be prepared properly.